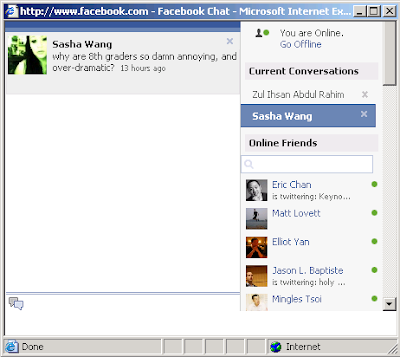 Facebook had just launched its own chat application. So far I have found the Facebook chat application to be useful and easy to interact with. Considering that I have over 50 friends online at any given moment, there is always someone to talk with. If you are my friend on Facebook definitely feel free to IM me, just don’t use it as a way to pitch me with business proposals. The one thing i dont like is that you can only open up a chat window at any one time but i dont reckon this to be a major problem.